This section discusses how the Lotus Cortina came into being, looking at the folks who were most influential in making the project happen together with the context of Ford and Lotus in the late 1950s/ early 1960s. This section stands alone so as to not swamp the Mk1 Lotus Cortina section. The stories of the development from Hugh Haskell and Jim Clark provide a fabulous insight into the development of the car, and the incredibly rare Engineering Presentation and January 1963 Press Pack provide a very rich understanding of the car as it was originally designed. The Lotus Cortina was the result of the unlikely coming together of the giant car manufacturer Ford of Britain, and the diminutive race car builder, Lotus. In the late 1950s the British car industry was changing, very slowly in the case of Ford, and at light-speed for Lotus. Ford needed a catalyst for their change, and Lotus needed some solid product and some large shoulders to stand on for their ambitious race and road car plans. Two things helped to develop the Ford and Lotus relationship; the development by an ex-Ford designer of the new 2 seater Lotus, the Elan, and the development of the Lotus Twincam engine, based on a derivative of the Ford 105e Anglia engine. When Walter Hayes was charged by the US parent to develop a programme in the UK that would promote the Ford product in motor sport over the coming 5 years, the relationship between Ford and Lotus had been established, so there was an obvious company to turn to for help. Ford needed some fairy dust to sprinkle on their very conservative products, and Lotus, who ran the most successful British racing team at the time and stood for innovation and progress, could provide it. Lotus had come to the attention of Sir Patrick Hennessy, Ford Britain Chairman, for their innovative car designs both on and off the track. Colin Chapman had contacted Sir Patrick directly in 1960 in order to secure Ford assemblies for his Lotus Seven Series road cars and Formula Junior race cars, and to establish potential supply lines for his new 2 seat sports car to replace the Elite. Chapman didn’t recognise the niceties of rank or Ford hierarchy, and went straight to the top if he needed something. Ford had been exploring ideas to increase their market share. The sports car market in the UK was booming, and with nearly 80% of the production of Austin Healey, MG, Triumph and Jaguar sports cars going to North America in the 1950s, Ford of Britain wanted a share. One of their young designers, Ron Hickman, had worked on the Anglia design, and submitted designs for a 2 seater car, based on the Anglia, for consideration. The proposals died through consideration-by-committee, with Ford just not having the confidence to break into such a different market. Ron Hickman jumped ship to Lotus in 1957, and helped finish off the design of and launch the Lotus Elite. His next job at Lotus was to design the replacement for the Elite, with a brief that it should be a cheaper and easier to live with than the Elite, more along the lines of the Austin Healey ‘Frogeye’ Sprite. He had been here before! As the design developed, Colin Chapman started to float the idea with Ford that Ford could manufacture his new sports car, made with a metal body rather than fibreglass, and they could then sell it world-wide through their normal dealer network. Ford engineers managed to kill off that idea. But it was another step forward in the development of the relationship between Ford and Lotus, and the concept of the two companies somehow sharing the design and build of a car, drawing upon each other’s strengths, had been established. The Elan ended up using many Ford assemblies, including the short engine, gearbox, differential, modified Anglia front struts (for the rear suspension!) and other smaller components. With the continuing and growing relationship, Ford gave the Elan full public relations support, with a press release and advert in the weekly motoring magazines announcing the Elan. The powerful strapline used was ‘Ford and Lotus Get Together To Power the Terrific New Lotus Elan 1500’. Quite some support for a tiny niche-market car manufacturer from a such a giant company . The Elan was also a far cry from the Frogeye Sprite concept, priced much the same as the Elite, and firmly in Jaguar E Type territory. This was a very positive move from the Ford executive viewpoint, helping to move their product another step up the value chain. Back in 1958, Lotus had to find a more robust, and much cheaper, engine for the Elite’s replacement, the Elan. 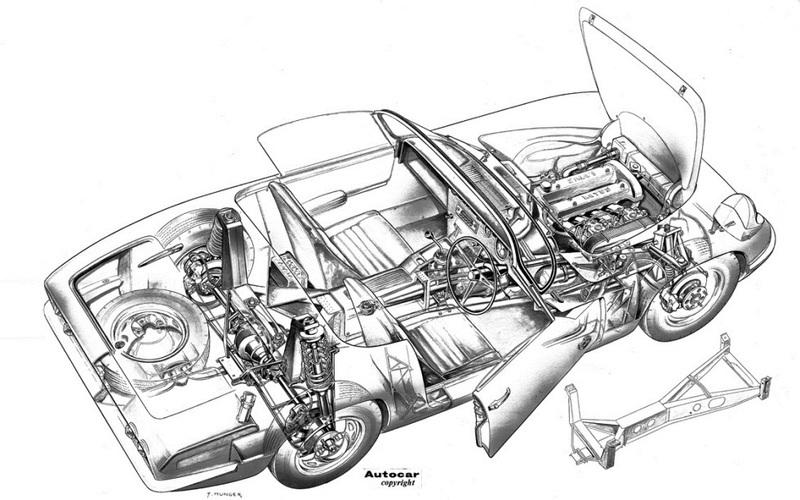 As the new sportscar was initially considered to be along the lines of the Austin Healey Sprite, the BMC ‘A’ Series engine was considered, and indeed Lotus had used that in some of their earlier cars. But when the Anglia was launched in 1959 with it’s new over-square robust design, CABC saw great merit in using the Ford engine as it was strong, cheap and Ford had a long term strategy for its use. 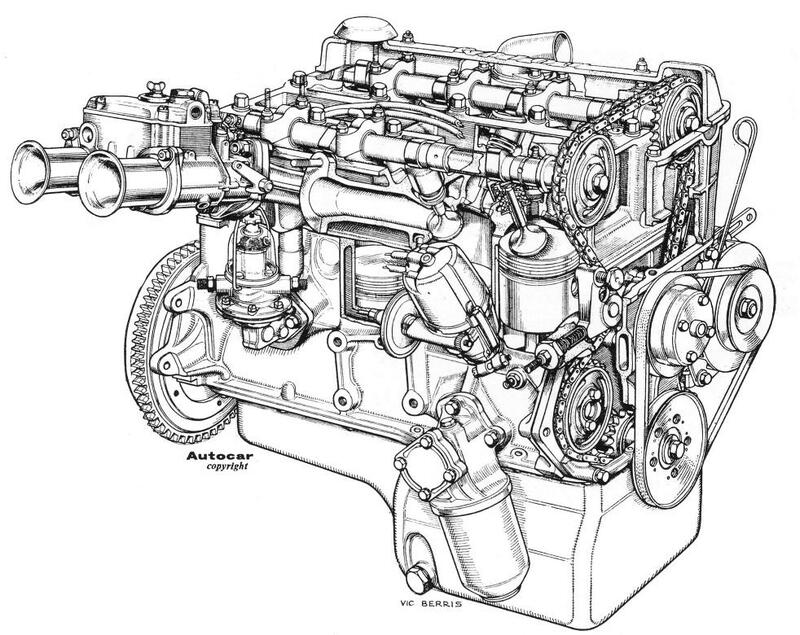 However, the standard engines at the time, the 105E from the Anglia and later, the 109E from the Classic, were not considered to be capable of developing the sort of power required, so the concept of a new, twin overhead cam cylinder head on a Ford block was developed. Harry Mundy, ex chief designer at Coventry Climax, completed the initial design work in early 1961, and Richard Ansdale continued the detail design over the summer of 1961. By the winter of 1961 a couple of prototype engines had been built, and fitted with a new front cover and head cast by Birmid in Wolverhampton. In early 1962 a tired Anglia with 40,000 miles on the clock was chosen to be the road going test bed for the new engine. The Anglia was built with an over bored 109E engine with the twincam head, and further refinements were made by Mike Costain, who was technical director at Lotus, and Harry Weslake. Jim Clark wrote in Ford Times in February 1963 how, in the winter of 1961 / 62, CABC persuaded him to drive this hot Anglia from Cheshunt back home to Duns in Scotland. He wasn’t too thrilled at the prospect, as he was a respected Formula 1 driver and used to driving an Elite or a Porsche for the same journey. But, upon lifting the bonnet and seeing a twincam engine sitting their with the ‘Lotus’ script on the cam covers, he set off for Duns, and had a lot of fun on the journey, upsetting many far more expensive cars en route. The next step was in May 1962, when the 1500 block (122E) with a 5 bearing crank was announced by Ford. Within 2 weeks, a 122E engine had been built with the twincam head, installed in a Lotus 23 which was raced by Jim Clark before May was out! And Jimmy was leading the race by a considerable margine until the exhaust manifold started to come loose, and overcome with exhaust gasses, he span the car and his race was done. There were still a lot of problems to sort out with the engine, but refinement continued throughout the rest of 1962 and into early 1963. 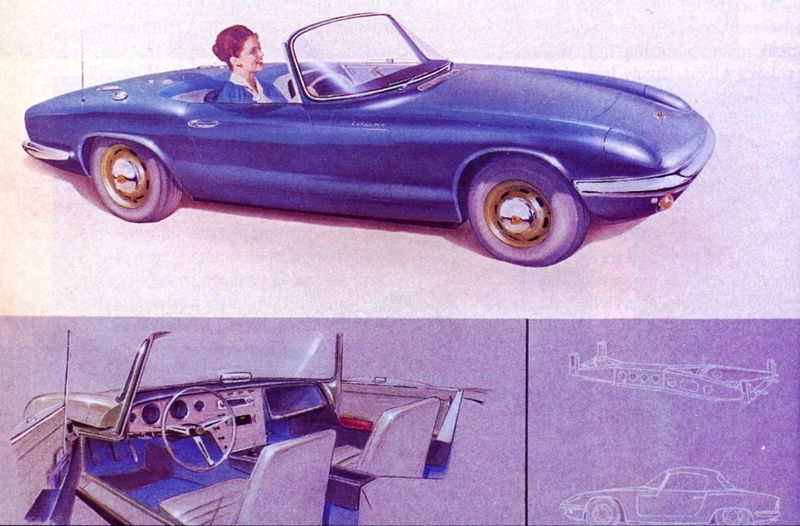 The Elan was launched at the London Motor show in October 1962, but it didn’t run. So looking back on 1962, Lotus had a car that cost them money every time they sold one (the Elite) and they were having difficulty selling it. They were having a lot of development problems with the Elan, which is where their main efforts were being focused, and the new Twincam engine was taking a lot longer than anticipated (at least, by Mr Chapman!) to get all the bugs ironed out. It was the perfect environment for the birth of yet another new car, the Type 28 Lotus Cortina, and another set of problems to solve. Sometime in the Spring of 1962, Colin Chapman had a meeting with Walter Hayes from Ford. Walter had been charged by the US parent to develop a programme in the UK that would promote the Ford product in motor sport over the coming 5 years, and he had heard about what Lotus were doing with his engine. The cash-strapped Lotus organisation and the ever optimistic Colin Chapman were delighted to enter into a deal whereby Lotus would modify the Cortina for fast road use, and build sufficient numbers for it to be homologated for racing. Ford would be responsible for producing the trimmed and painted bodyshell and for the sales and marketing of the car, whilst Lotus would assemble the cars. Lotus needed this deal to give them the next step up in road car production. They constantly had issues with cash flow as their road cars, in the Elite and Severn, were not delivering the profits required to support their racing ambition. They were also rapidly running out of space, and the deal with Ford allowed Lotus to build a new 2 story building on the back of their existing factory….downstairs for the new Elan, upstairs for the new Cortina. Ford of Britain needed the deal every bit as much as Lotus, but for very different reasons. Their product range was considered to be very conservative, even old fashioned, in 1959, when the Anglia was launched alongside the Austin Mini. The press couldn’t help point out just how innovative the Austin offering was, with it’s transverse engine with the gearbox in the sump, along with the radical new independent ‘Moulton’ rubber suspension. 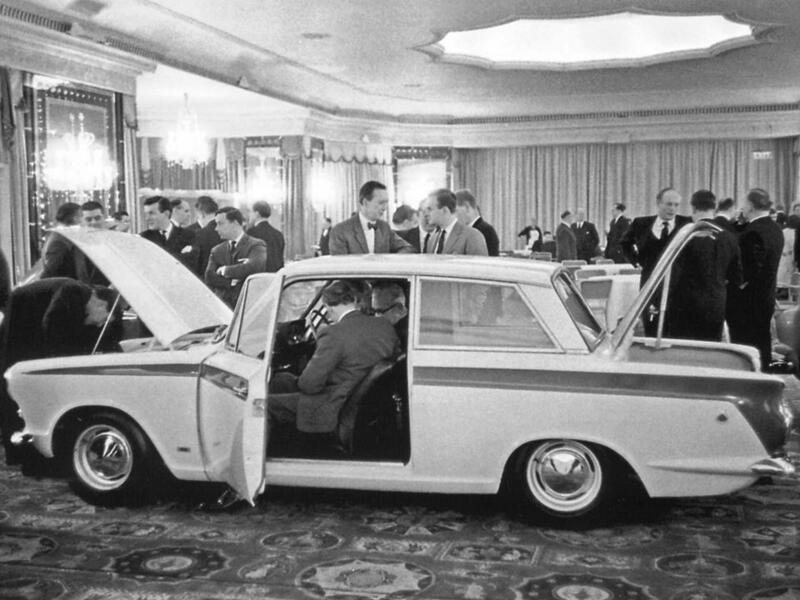 The Cortina, shortly to be launched, was an almost identical specification to the Anglia, and wasn’t going to win any prizes for innovation either! In July 1962, CABC appointed Hugh Haskell to be the engineer in charge of the Cortina project. They had a couple of meetings with Harley Copp, the Ford Director of Engineering, to set out the initial plans for the detail design and development of the car, and the Lotus draftsmen were charged with specifying the special parts required for the new car. In August 1962, a 1200 deluxe Cortina, in an uninspiring shade of grey, was delivered to Cheshunt under wraps, and this was to become the main development car. In October, Jim Clark was secretly photographed putting the modified car through it’s paces at Silverstone. 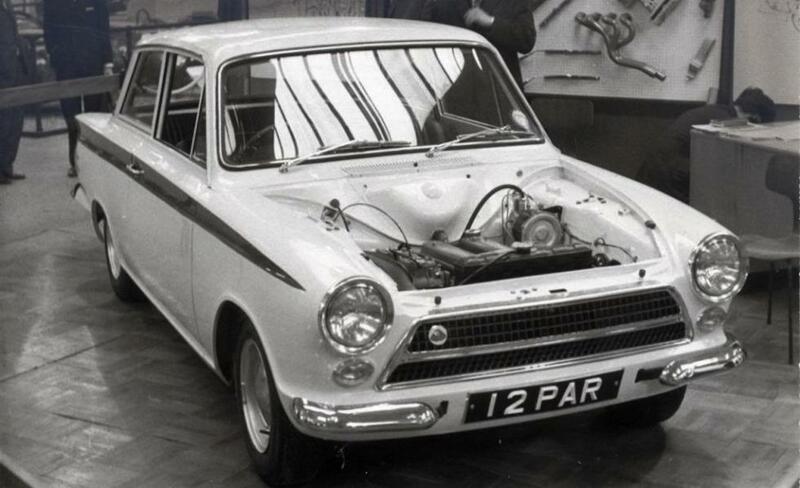 Jimmy played an important role in testing and specifying improvements for the Lotus Cortina from the outset, which probably partially explains his love affair with the car for the next 6 years. By October 1962, the standard Ford Cortina was announced to the world at the London Motor Show, but work still hadn’t started in earnest refining the Lotus Cortina project due to the focus on the Elan and the twincam engine issues. But by January 1963, the Lotus Cortina was announced to the press in Monte Carlo on January 23rd ,and then shown at the 4th Racing Car show at Olympia (January 25th to February 2nd). In reality, it was to take Lotus many more months to get going properly with the production of the Lotus Cortina, and by the middle of the year only a small handful had been produced. But this ‘intent’ was enough back in 1963 to get the car homologated for racing, and on 5th September 1963 the RAC / FIA issues the homologation papers for the ‘Consul Cortina (Developed By Lotus)’.